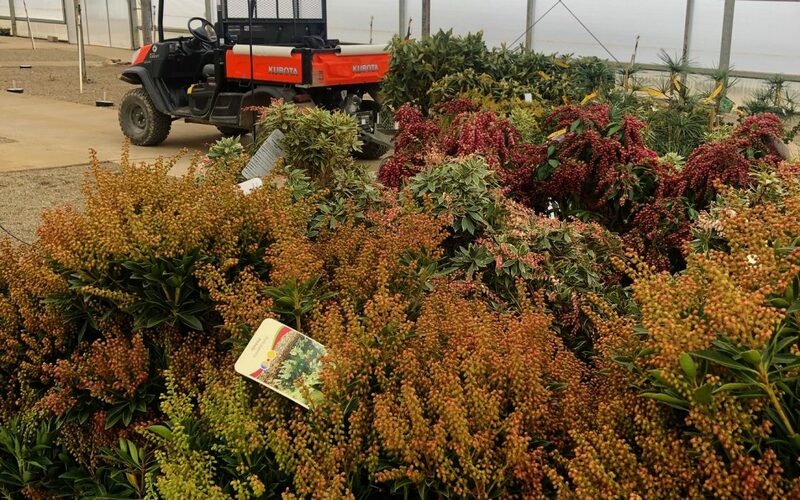 This week is considered “hell week” at the nursery as semi truck loads of product have been received that must be unloaded, counted, tagged and then put away very quickly as sometimes two loads arrive at once and there is no time to rest or otherwise pause in the endeavor. All the while, a huge order of small perennials has arrived that need to be sorted, counted and then potted at the same time. If that weren’t enough, some bareroot trees have arrived and the greenhouse planting has cranked up to a feverish pace! Mayhem is the code word at the nursery for the next month as we struggle to protect stock and then start setting up the sales yard and greenhouse. Some repairs to sprinkler risers and clean up of fallen trees still goes on from the severe wind storm from the end of February that saw gusts up tp 60 miles per hour. This year with the addition of Collin Foltz for landscape design, we should be much better at serving customers in-house as Collin has a degree in horticulture and landscape design form The Ohio State University. With his addition to the skills of Jeff, our store manager, designs from a simple sketch for a foundation planting to major landscape renovations will not be beyond our scope. Soon, Ohio Edison will install one new transformer in order to get the new large installations of solar panels on line to finally negate electricity use from the grid that we use in the store and in the greenhouse. Will you have Marconi pepper plants this year ? Hi Keith. As of right now, they are not on our grower lists but please check back if you are unable to find them.